Surprisingly, it is not what you think. The Zone Diet is a way of life that helps you lose fat and increase wellness by reducing cellular inflammation. It's cellular inflammation that is the underlying cause of not only weight gain and the acceleration of chronic disease, but also the reason behind decreasing physical, emotional, and mental performance. The Zone Diet was developed by Dr. Barry Sears, one of the world's leading authorities on the hormonal effects of food and their effect on cellular inflammation. At Zone Labs they continue to create a number of unique dietary products that make it easier to follow the Zone Diet. I was lucky enough review Dr. Sears’ Zone™ Nutrition Shakes - Sample Pack and shaker. 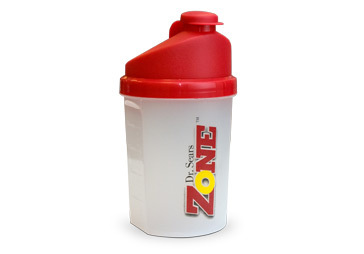 Delicious Zone Shakes serve as a tasty meal replacement, a healthy pre-workout snack or post workout recovery drink. Made with our Controlled Release Nutrition™ technology to stabilize blood sugar and conserve calories throughout the day, helping you to burn stored body fat as your primary fuel source instead of storing incoming calories as fat. The Zone allows you to stay fuller on fewer calories. When mixed with 8 ounces of 2% milk, Zone shakes are 310 calories. The best way to mix your Zone Shakes and take them on the go. The slightly larger diameter enables quicker mixing and washes more easily than taller, thin mixing cups. There is also a removable grate on the inside that makes the shake slightly frothy while helping to ensure all of the Zone Shake mix blends perfectly with the milk. The opening at the top of the cover makes it easy to drink straight from the cup while preventing any accidental spills. I was so glad to be able to get the shaker with the samples. The shaker makes it so easy to prepare the meal replacement shakes. It is simply open the package and mix it with 8oz of 2% milk and shake. Each meal replacement shake is only 310 calories. The sample package of the meal replacement shakes came with 3 flavors. The flavors are Strawberries n' cream, French vanilla and Milk Chocolate. The best part about the meal replacement shakes are they taste GREAT! I also like that they are Made with our Controlled Release Nutrition™ technology to stabilize blood sugar and conserve calories throughout the day. Each meal replacement shake has 16g high-quality protein, 4g of fiber and are vitamin fortified! Each meal replacement shake full filled me for up to 4 hours so that i didn't nibble thruout the day cuz I wasn't hungry! Giveaway~ Dr Sears has offered 3 of my readers the same set that I got to review ~ The sample pack of the 3 great tasting flavors of meal replacement shakes and the shaker cup to try the Zone for themselves! Here is what the winners will receive! To enter to win, please enter via the raffle copter form below. If the entry method asks you to like or follow, please include your id to the site you liked or followed. All entries will be checked. If you are found to have cheated ALL entries will be deleted. If you tweet about the giveaway please leave the URL so i can verify that entry. disclosure~ I received 3 meal replacement shakes and a shaker in exchange for this review and giveaway from Dr Sears' Zone website. Oh awesome, I've been wanting to try this. And I like your review of the product. My fingers are crossed! Glad I found you thanks to Tight Wad in Utah. I've been wanting to give this a try. I have read a lot of good things about it. Thanks for the giveaway, I am curious about this product and look forward to trying it. Hello, I would love to try these and see how they stack up against others. I like that this is good to help you lose wieght. Thanks for the Giveaway! I'd love to win this for my hubs. I like the variety of foods that you can choose from, and that it is all "real" food.